This trip had always been on my bucket list. We flew to Buenos Aires and explored the city for two days. BA has been called the Paris of the South. It is a beautiful and elegant city. 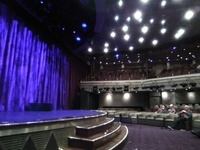 We were impressed by the Norwegian Sun&apos;s renovations. The ship looked beautiful, clean and brand new. Our first stop was beautiful Montevideo, Uruguay, a historical lovely city. Our second stop was Punta del Este, Uruguay, a beautiful resort destination. Then, we cruised to Puerto Madryn, Argentina, which was originally settled by the Welsh. We could have taken the Welsh city tour. However, we chose to take the Valdes Wildlife refuge tour instead. We saw amazing animals such as sea lions, elephant seals and Magellanian penguins. Our next stop was Stanley in the Falklands. That was also an amazing center for wildlife viewing. We walked with the penguins on Bertha&apos;s Beach which was one of our most amazing lifetime experiences. Stanley itself looks so very British and charming. We only stayed half a day in Stanley and had to leave a bit early due to a bad weather forecast. That&apos;s typical for the geographic area. In fact, a cruiser who had taken the same trip 14 times told us that many times, ships can&apos;t dock in certain ports in that area due to weather conditions. We were lucky, because we only had one rocky morning. Otherwise, the ship was as smooth as glass. The sail around Cape Horn brought back memories of history lessons at school. I remembered hearing about Magellan sailing around the Cape in the 16th century. I remembered reading James Michener&apos;s Hawaii and visualizing the trip around the Horn. Actually Cape Horn is just an island, but it was memorable. Our next stop was Ushuaia, the most Southern city in the world. It reminded me of ports in Alaska and is the gateway to the Beagle Channel. We went to the gorgeous Terra del Fuego National Park. However, with the wind chill factor, it was in the 30s with freezing rain. This was summer no less. We visited Punta Arenas, the most Southern port in Chile. Then, we sailed through the Chilean Fjords and the Straight of Magellan. Imagine being surrounded by snowy mountains and glaciers as you sail through the strait. We saw penguins and sea lions on a small island right in the middle of the Straight. The views were breathtaking. When we arrived in Puerto Montt, we saw Puerto Vayas, a city founded by the Germans. However, there was nothing very German about it. However, we went to the marvelous cowboy dancing and rodeo demonstration followed by a wonderful late lunch of unlimited grilled meat, fruit and vegetables. Sadly, our cruise ended in San Antonio, Chile. It was a wonderful experience. The ship itself was newly outfitted and gorgeous. The food was for the most part decent. However, we ordered steak in the dining room, and it was tough. The steak at Cagney&apos;s Steak House however, was delicious. The 11th floor was almost always crowded, especially on tour days. One maître&apos; D told me that was nothing. "You should see the buffet crowds on the bigger ships," he joked. The one thing I didn&apos;t like was the price of the tours, but the tour package was a bargain. Even company tours outside of Norwegian had expensive tours. Prepare to shell out about $150 per person for most tours, onboard ship or off. Some may be less, but they are far and few between for what I could tell. We also heard that not many captains like to take this route, because it is treacherous, but Captain Teo did an amazing job. The central area with elevators. This trip had always been on my bucket list. We flew to Buenos Aires and explored the city for two days. BA has been called the Paris of the South. It is a beautiful and elegant city. We were impressed by the Norwegian Sun&apos;s renovations. The ship looked beautiful, clean and brand new. Our first stop was beautiful Montevideo, Uruguay, a historical lovely city. Our second stop was Punta del Este, Uruguay, a beautiful resort destination. Then, we cruised to Puerto Madryn, Argentina, which was originally settled by the Welsh. We could have taken the Welsh city tour. However, we chose to take the Valdes Wildlife refuge tour instead. We saw amazing animals such as sea lions, elephant seals and Magellanian penguins. Our next stop was Stanley in the Falklands. That was also an amazing center for wildlife viewing. We walked with the penguins on Bertha&apos;s Beach which was one of our most amazing lifetime experiences. Stanley itself looks so very British and charming. We only stayed half a day in Stanley and had to leave a bit early due to a bad weather forecast. That&apos;s typical for the geographic area. In fact, a cruiser who had taken the same trip 14 times told us that many times, ships can&apos;t dock in certain ports in that area due to weather conditions. We were lucky, because we only had one rocky morning. Otherwise, the ship was as smooth as glass. The sail around Cape Horn brought back memories of history lessons at school. I remembered hearing about Magellan sailing around the Cape in the 16th century. I remembered reading James Michener&apos;s Hawaii and visualizing the trip around the Horn. Actually Cape Horn is just an island, but it was memorable. Our next stop was Ushuaia, the most Southern city in the world. It reminded me of ports in Alaska and is the gateway to the Beagle Channel. We went to the gorgeous Terra del Fuego National Park. However, with the wind chill factor, it was in the 30s with freezing rain. This was summer no less. We visited Punta Arenas, the most Southern port in Chile. Then, we sailed through the Chilean Fjords and the Straight of Magellan. Imagine being surrounded by snowy mountains and glaciers as you sail through the strait. We saw penguins and sea lions on a small island right in the middle of the Straight. The views were breathtaking. When we arrived in Puerto Montt, we saw Puerto Vayas, a city founded by the Germans. However, there was nothing very German about it. However, we went to the marvelous cowboy dancing and rodeo demonstration followed by a wonderful late lunch of unlimited grilled meat, fruit and vegetables. Sadly, our cruise ended in San Antonio, Chile. It was a wonderful experience. The ship itself was newly outfitted and gorgeous. The food was for the most part decent. However, we ordered steak in the dining room, and it was tough. The steak at Cagney&apos;s Steak House however, was delicious. The 11th floor was almost always crowded, especially on tour days. One maître&apos; D told me that was nothing. "You should see the buffet crowds on the bigger ships," he joked. The one thing I didn&apos;t like was the price of the tours, but the tour package was a bargain. Even company tours outside of Norwegian had expensive tours. Prepare to shell out about $150 per person for most tours, onboard ship or off. Some may be less, but they are far and few between for what I could tell. We also heard that not many captains like to take this route, because it is treacherous, but Captain Teo did an amazing job. We got an upgrade to a balcony cabin from our initial window cabin. We enjoyed our although it was too cold in many ports to sit outside. Everything was clean. The cabin was just the right size for two. The couch and bed were comfortable. We had an excellent view for the gorgeous scenery. Because the Sun was upgraded a few months ago, everything was new. We thought the cabin was excellent. We had an awful experience which was part of an all-day package tour. The bus arrived late, raced through every stop, and I suspect they were supposed to stop at Recoleta, but didn&apos;t do so. Then, they wanted to drop us off 15 blocks from our hotel or drop us off at Avenue 9 de Julio. We would had to cross this huge street and walk several blocks. Finally, we negotiated for them to drop us five blocks from the hotel. Not a good experience. Outstanding tango show and dinner at the Tango Porteno. This is an old Art Deco theater. We had a wonderful steak dinner beforehand with wine or a soft drink. The show&apos;s dancers were beyond amazing. They were accompanied by a live Tango orchestra. It was an evening to remember. This was a beautiful boat ride down the Rio Plate to Tigre. This river is the widest river in the world. The water is brown because of the sediment on the bottom, not because the water is dirty. We cruised through lovely canals lined with summer houses. This was an interesting tour, but the best part was the tango show that was part of the same tour. We went to a small tango cafe from the 1930s and watched a tango demonstration by several dancers. The city tour was too short for me to even get a good picture of Montevideo. I would have done better by an Internet tour with Google Street Maps. WE first stopped at Puerta Varas. It was supposed to be a German city, but there was little evidence of Germany. Instead they an interesting waterfront sculpture show. The city was attractive, but it didn&apos;t overly impress. However, the next part of the tour was OMG. We went to see the Chilean cowboys(huasos) sing, dance and do a rodeo demonstration. The horses gallop sideways. It was amazing. Afterwards, we enjoyed a fabulous late lunch of unlimited grilled beef, chicken kabobs, pisco sours, Chilean wine, fruit and vegetables. This tour took us around town and to two museums. The first museum was a Salesian museum featuring the history of the area centered around a missionary Catholic priest who helped the indigenous people of the area. There are stuffed formerly live animals of the area such as condors, penguins, pelicans, etc. There were also Indian artifacts. The small gift shop near the entrance was great. . We didn&apos;t get to go shopping at Ushuaia. We bought some lovely jewelry and tee shirts there. Punta del Este looks a bit like Miami at first, but it is very different. It has beautiful beaches, shops, and cafes. The beaches were very crowded, and the weather was pleasantly warm. We enjoyed a nice pizza lunch and walked around the area. We took a ship&apos;s tour and were very pleased. This tour was one of the outstanding experiences we ever had. We drove with another couple ot Bertha&apos;s Beach. It was crowded with Gentoos and a King penguin couple who hung out with them and literally posed for tourists. (I am not kidding.) We were right there with the birds and walked along with them around the beach. I didn&apos;t want to leave even though it was a bit chilly. Unbelievable. It was a spiritual trip almost. WE had cold and lousy weather although it was summer. Despite the freezing rain, we saw this breathtaking national park and the end of the Pan American Highway. It would have been the perfect trip if the weather had been better.Still, we loved it. Our 21st cruise, 3rd on NCL. Terrible Service.